All are welcome to join in for Sunday School and Worship every Sunday morning. We celebrate communion in the worship service on the first Sunday of each month. Also on the first sunday we enjoy a potluck meal together following the service (If you have never been feel free to come as our guest, there is always enough food). A Mid-week opportunity to enjoy the company of others in an informal setting. The doors of the church are open for a couple of hours. Often times there is soup. Always coffee. The kids are welcome to come and color or join the group. Wednesdays, Noon to 2:00 at the church. Come when you can and leave when you must! Enjoy a walk through a book of the Bible with Pastor Carl. 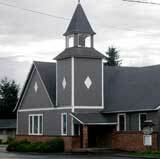 No need to call Sumas A.C. Church your home. This is a true community Bible Study. All are welcome. All men are invited to enjoy breakfast and some hang-out time together. All women are welcome to join in the planning of special programs and other ministries throughout the year that benefit the church, the community, and world missions. All are welcome to choose free clothing from the racks of donated gently used clothing regardless of financial circumstances or church affiliation. Quarterly family nights with food, music, and games as well as occasional special programs are sprinkled throughout the year. The SACC church building was built in 1913. To contact the church for more information about any of the programs, please call the church at 360.988.2503 and leave a message or email us. The Sumas Community Clothesline building is located behind the church adjoining the parking lot. All the clothing is donated by members of the community. Hundreds of hours are contributed by volunteers who sort and display the selections. The building may look small, but it is amazing how much activity takes place in it. Our informal church motto: "Do the best with what you are given."